How to understand segment insights? Ever wonder how you can see eCommerce results on your segmented list, and understand if one segment is truly different than another? In this guide, you'll learn how to access, understand and compare key metrics for your segmented lists. Step 2. Choose the list to report on. Simply click on the name of the list. Step 3. Within the list, click on "View Stats" from the upper right corner of the screen. This brings up the summary dashboard. Revenue - Total dollar value spent by the contacts within this segmented list. This can also be known as the lifetime value. Customers - Count of contacts in the list who have made a least one purchase. Revenue Per Contact - Average revenue per list contact. AOV - Average order value. Revenue divided by number of orders. One-Time Customers - The number of customers who only made one purchase. Customer One-Time Rate - Percentage of your customers in this list who only purchased once. Repeat Customers - The number of customers who made two or more purchases. Customer Repeat Rate - Percentages of the customers who are repeat customers. Orders Per Contact - Average number of orders per list contact made. Orders Per Customers - Average number of orders for every customer within the list. By default, the date range shows the full history of the contacts within the list to current day. To view the summary statistics for a different period, you can follow the steps below. Step 1. 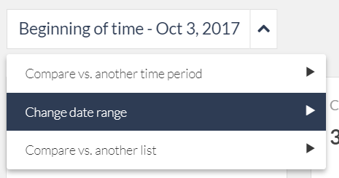 Within the Segment Insights Dashboard, select the filter options to "Change date range". Previous month - this selects the entire month prior to the current one. For instance, if we are in October, Previous Month will default to the month of September. Step 3. Hit apply to see the updated statistics. To select a different filter, click on the "Clear Filters" button. 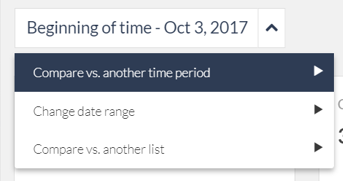 You can compare one date range vs. another using Segment Insights Dashboard. Step 1. 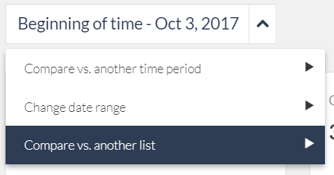 Within the Segment Insights Dashboard, select the filter options to "Compare vs. another time period". Step 3. Hit apply to see the update statistics. The dashboard will show the current period against the previous, along with the % change between the two periods. 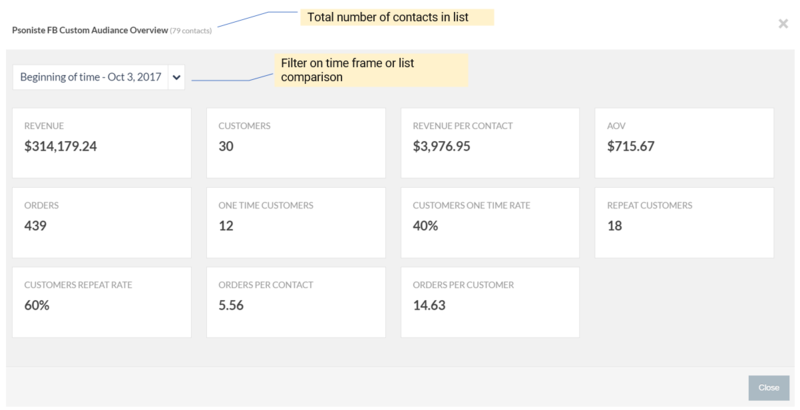 You can compare one segmented list vs. another using Segment Insights Dashboard. Currently, the comparison is run on the overall history of the contact. In the near future, we'll also introduce the dimension of time filter for the list vs. list comparisons. Step 1. Within the Segment Insights Dashboard, select the filter options to "Compare vs. another list". Step 2. Select the list that you would like to run the comparison on. Hit Apply, and let the dashboard refresh. Step 3. The dashboard will show the original list against the comparison list, along with the % change between the two lists.